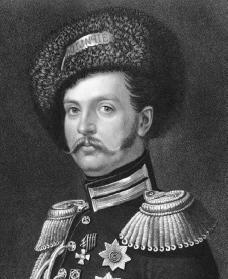 Alexander II was emperor of Russia from 1855 to 1881. He is called the "czar liberator" because he freed the serfs (poor peasants who lived on land owned by nobles) in 1861. Alexander's reign is famous in Russian history and is called the "era of great reforms." teacher. Alexander learned to speak Russian, German, French, English, and Polish. He gained a knowledge of military arts, finance, and diplomacy, or the study of dealing with foreign countries. From an early age he traveled widely in Russia and in other countries. For example, in 1837 he visited thirty Russian provinces, including Siberia (a frigid, northern region of Russia) where no member of the royal family had ever visited. Unlike his father, Alexander had various military and government jobs throughout his younger days. In fact during Nicholas's absence Alexander was given the duties of the czar, or Russian emperor. Before he became czar, Alexander did not believe that freeing the serfs was a good idea. He changed his mind because he believed that freeing the serfs was the only way to prevent them from revolting. However, freeing the more than forty million serfs was not an easy task. In 1861 Alexander created an emancipation, or freedom, law, which said that serfs could now marry, own property, and argue court cases. Each landowner had to determine the area of land owned by the serfs. Landowners also had to pay the serfs for the work they did. Each peasant family received their house and a certain amount of land. Land usually became the property of the village government, which had the power to distribute it among the families. Peasant families had to make payments for the land for more than forty–nine years. The original landowner kept only a small portion of the land. The emancipation law of 1861 has been called the greatest single law in history. It gave the serfs a more dignified life. Yet there were many problems. In many cases the serfs did not receive enough land and they were over-charged for it. Since they had to pay for the land, they could not easily move. Still, overall it was a good law for the Russian people. Because the serfs were now free citizens, it was necessary to reform the entire local system of government. A law in 1864 created local assemblies, which handled local finances, education, agriculture, medical care, and maintenance of the roads. A new voting system provided representation to the peasants in these assemblies. Peasants and their former landowners were brought together to work out problems in their villages. During Alexander's reign other reforms were also started. Larger cities were given governmental assemblies similar to those of the villages. The Russian court system was reformed, and for the first time in Russian history, juries, or panels of citizens called together to decide court cases, were permitted. Court cases were debated publicly, and all social classes were made equal before the law. Censorship (or the silencing of certain opinions) was eased, which meant that people had more freedom of speech. Colleges were also freed from the rules imposed on them by Alexander's father Nicholas I.
Alexander also had success in foreign relations. In 1860 he signed a treaty with China that ended a land dispute between the two nations. Russia successfully ended an uprising in Poland in 1863. Then in 1877 Alexander led Russia to war against Turkey in support of a group of Christians in the areas of Bosnia, Herzegovina, and Bulgaria. Despite the many reforms Alexander II made to improve the lives of the Russian people, in 1866 he became the target of revolutionaries, or people who fight for change. Terrorists, or people who use violence to achieve their goals, acted throughout the 1870s. They wanted constitutional changes, and they were also upset over several peasant uprisings that the government violently put down. A member of a terrorist group murdered Alexander II on March 1, 1881, in St. Petersburg, Russia. Almedingen, E.M. The Emperor Alexander II. London: Bodley Head, 1962. Mosse, W. E. Alexander II and the Modernization of Russia. Rev. ed. New York: Collier, 1962. Van der Kiste, John. The Romanovs, 1818–1959: Alexander II of Russia and His Family. Stroud, Gloucestershire, England: Sutton, 1998.